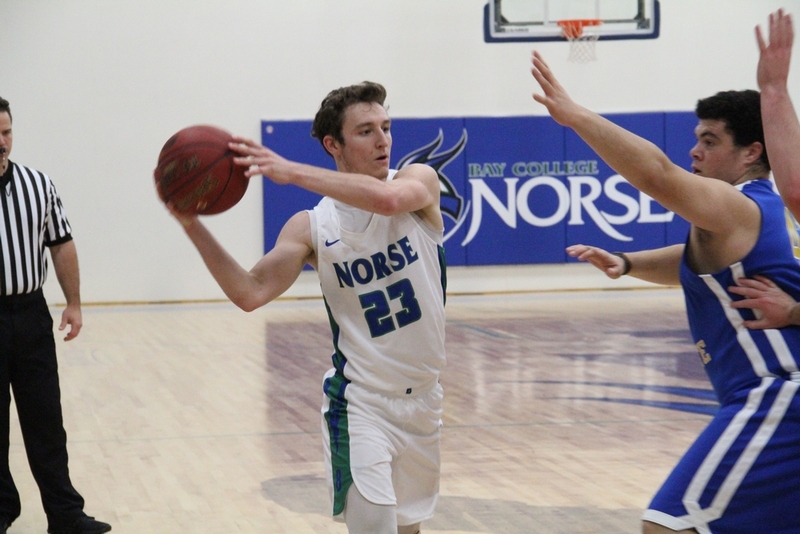 ESCANABA---The Bay College Norse men's basketball team won its fourth straight game on Monday, beating the Lake Superior State University Junior Lakers, 91-60, at the Northern Lights YMCA Gymnasium. 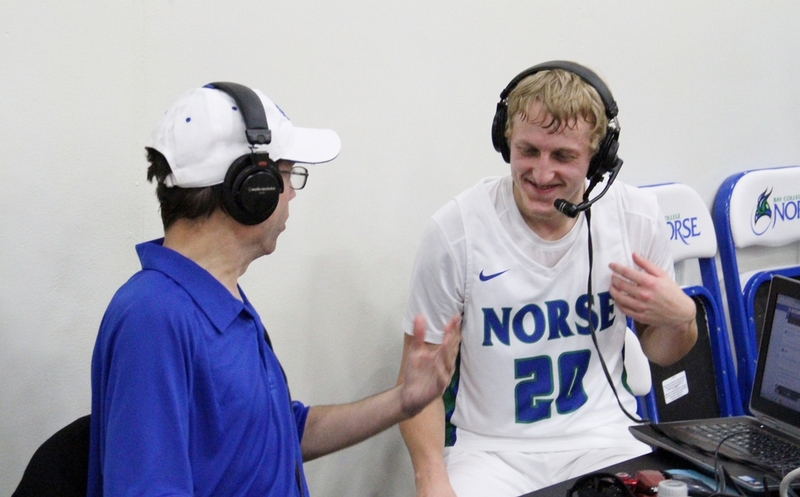 All twelve Norse players who suited up in the game scored at least two points. 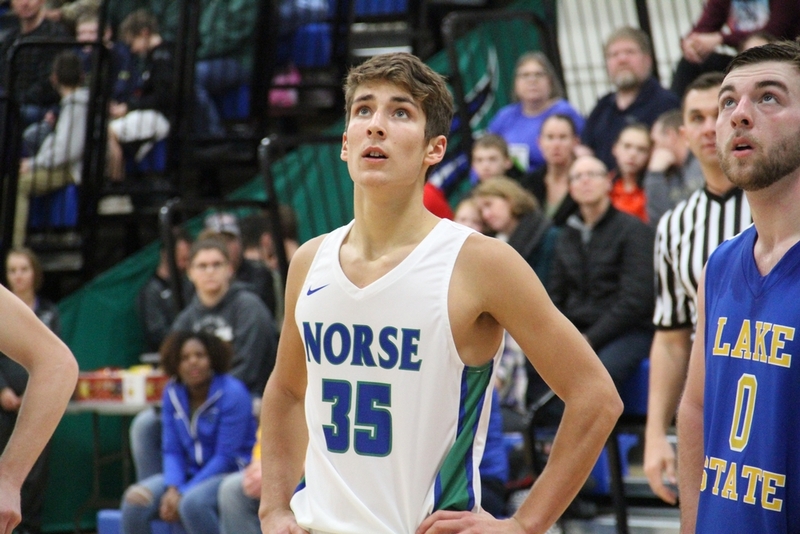 Escanaba graduate Tyler Willette scored a game-high 22 points, including eight points early in the game as the Norse took a 14-5 lead. 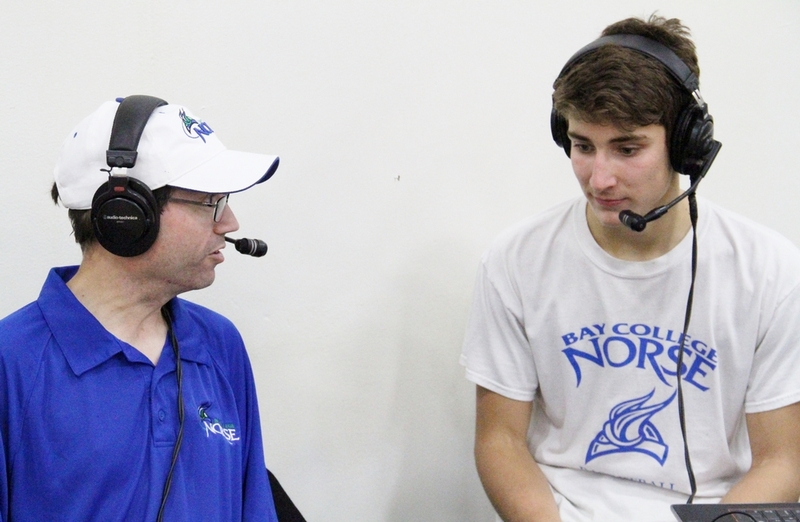 Bay College Coach Matt Johnson substituted freely, with all twelve guys getting lots of playing time. 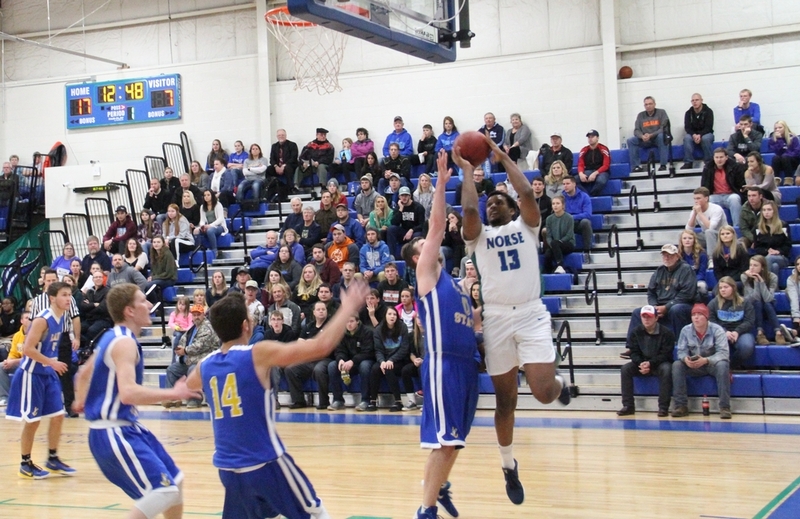 "There were multiple times when we had guys that could have probably taken their guy off the dribble, or tried to make a play one-on-one, and they didn't," Johnson said. 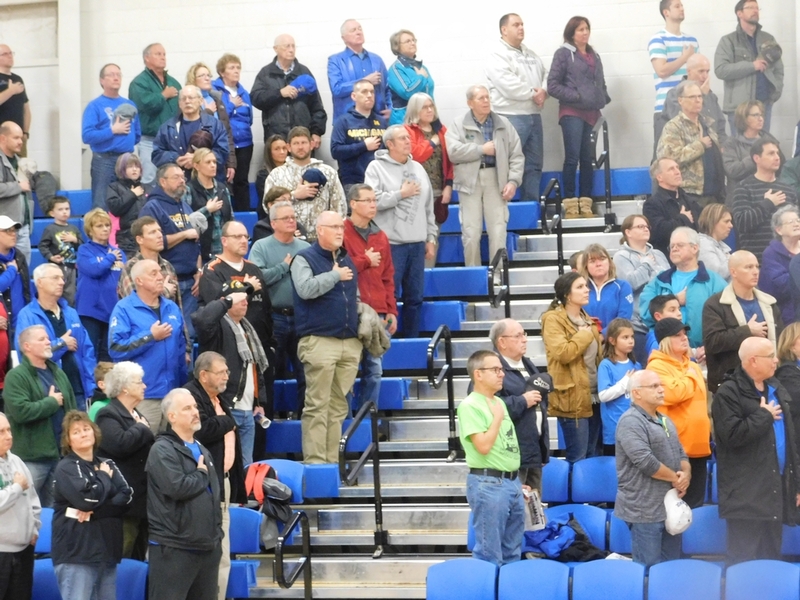 "They moved the ball, and made the extra pass, or set an extra screen to set a teammate up. "That's what we've been looking for all year. 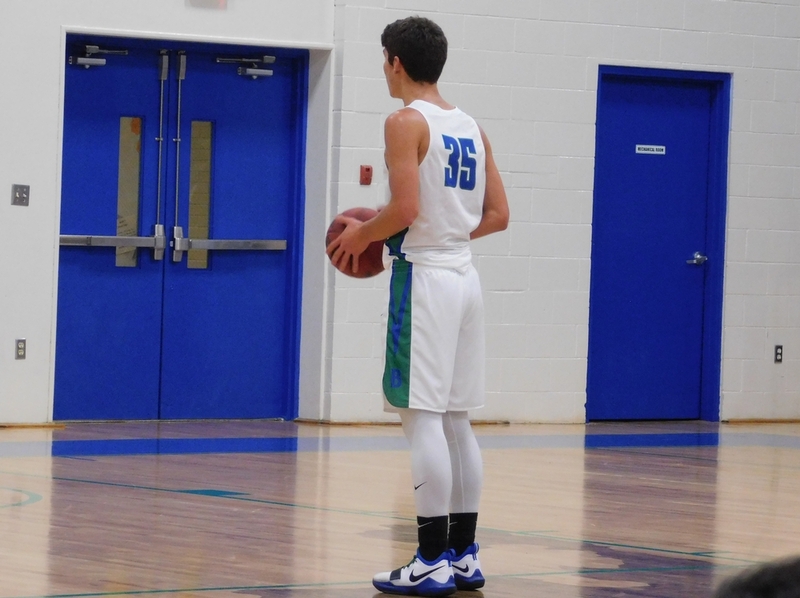 Hopefully this carries over next weekend when we play in Ironwood, moving the ball, because we're not a selfish team." 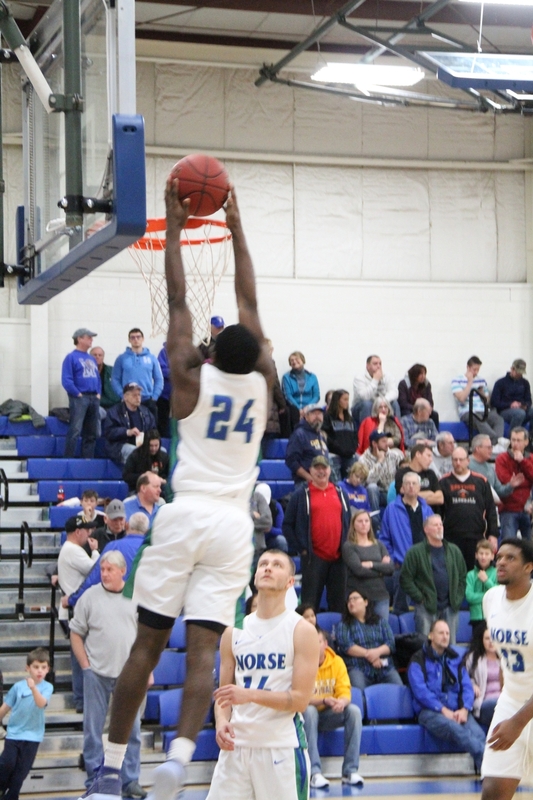 The Norse took a 40-24 late in the first half when Gladstone native Joe Gibbs took a Willette pass and slammed it home for his sixth dunk of the season. 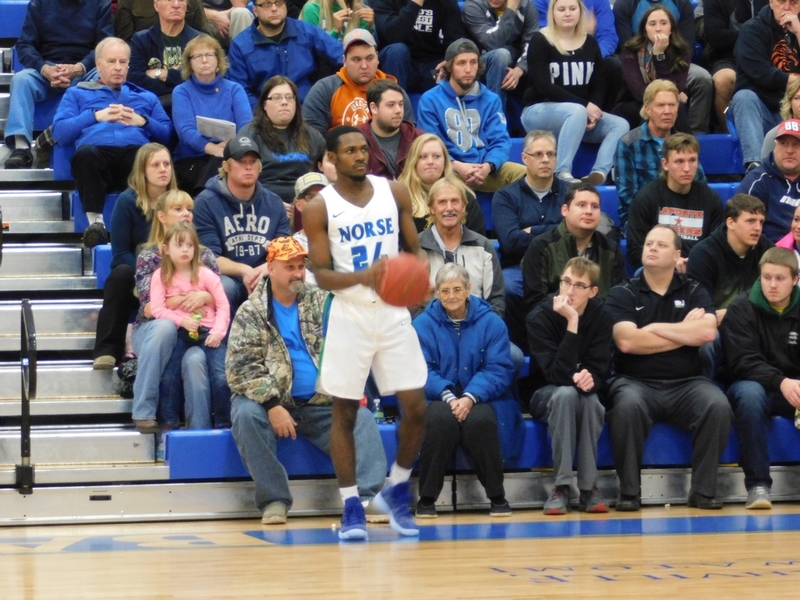 Dontae Ellis came off the bench to score eight points as the Norse grabbed a 44-28 lead at halftime. 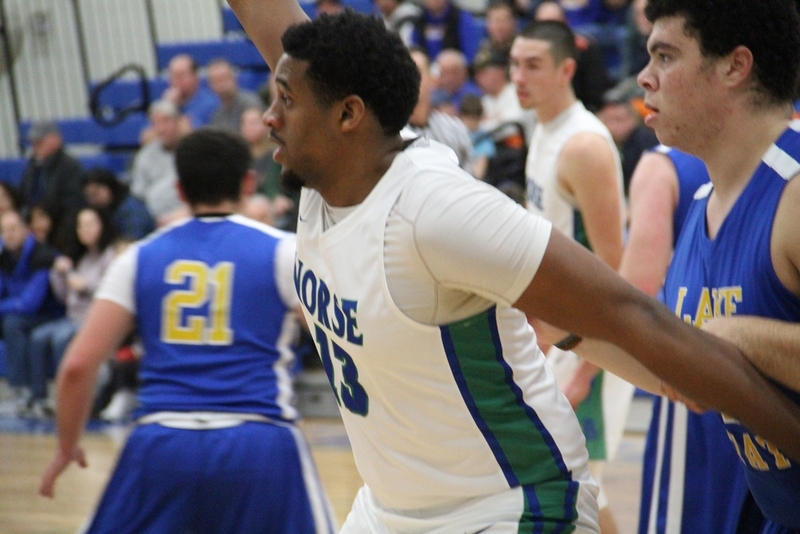 Bay's 6-foot-10 center Kobi Lumsden-Barnes scored the first seven points of the second half ro make it a 51-28 game, and the Norse were on cruise control from there. 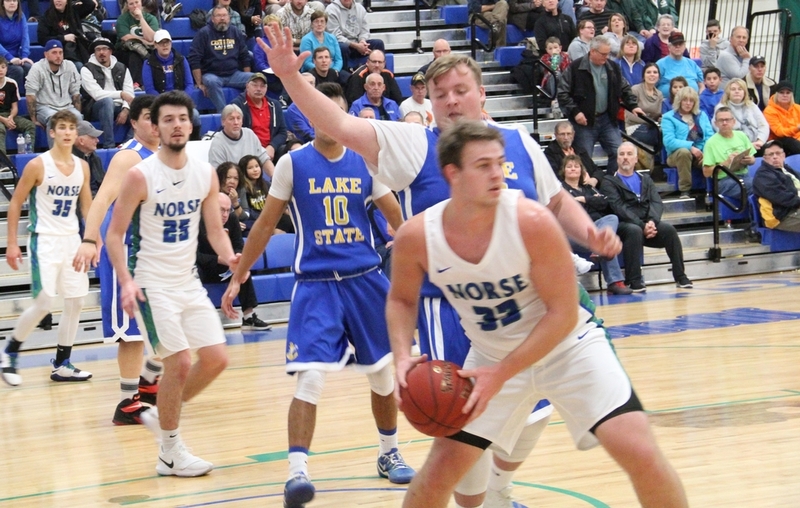 Bark River-Harris graduate Jace Briggs came off the bench to score seven points on a triple, driving lay-up, and two technical foul free throws. 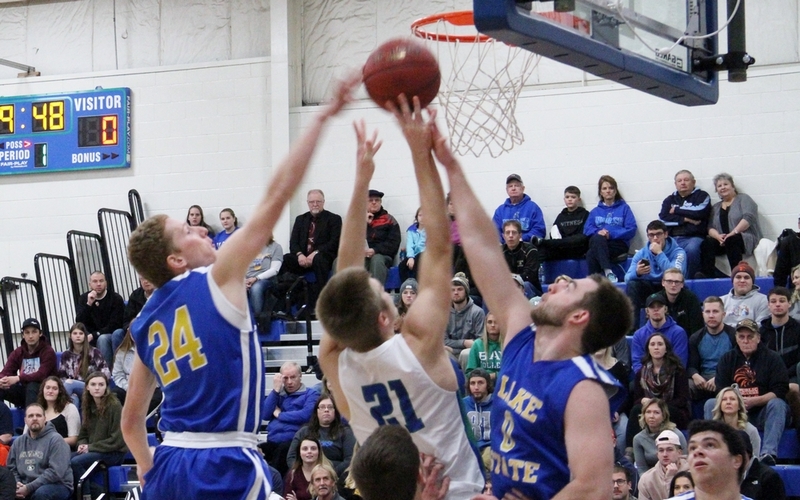 Mid Peninsula graduate Damian Richmond got a hoop and a couple of free throws, and Republic-Michigamme graduate Hunter Schultz scored his first collegiate basket. And he had an assist. "It felt pretty good," Richmond said. "I thought the team, together, just played as a group and we got it done. Ran our offense. Played really good defense. We've been putting in new defenses, trapping on every pick 'n' roll." "It was exciting," Schultz said. "I never expected me to actually make that, to be honest with you. I was going to take it out, but I decided to put it up because we were up by so much. I don't get to play much, but that's OK, and it felt good!" "I was happy about that," Briggs said of making his triple, but added, "but I should've made the other two. Whether I'm in the game or not, I always try to stay focused. 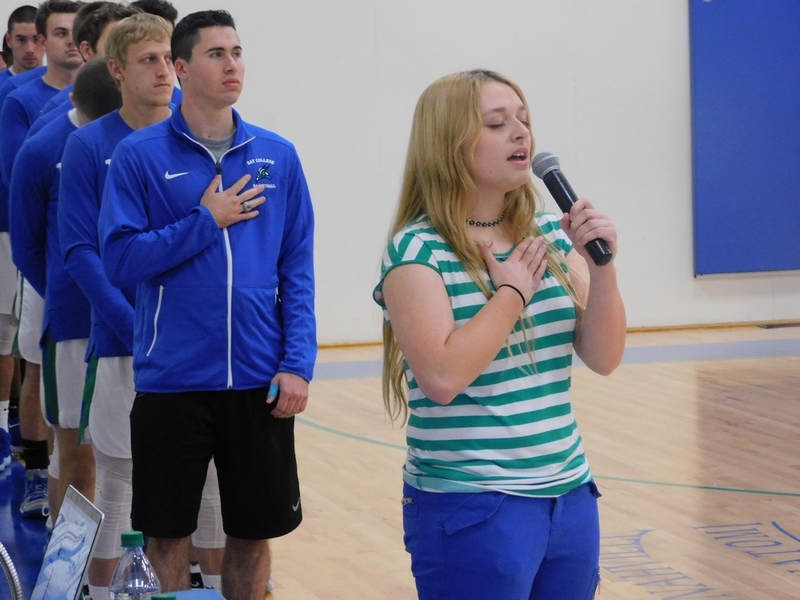 If I'm on the bench, I'm supporting my teammates, being loud. And when I get in the game, I just try to go as hard as I can, play my role. 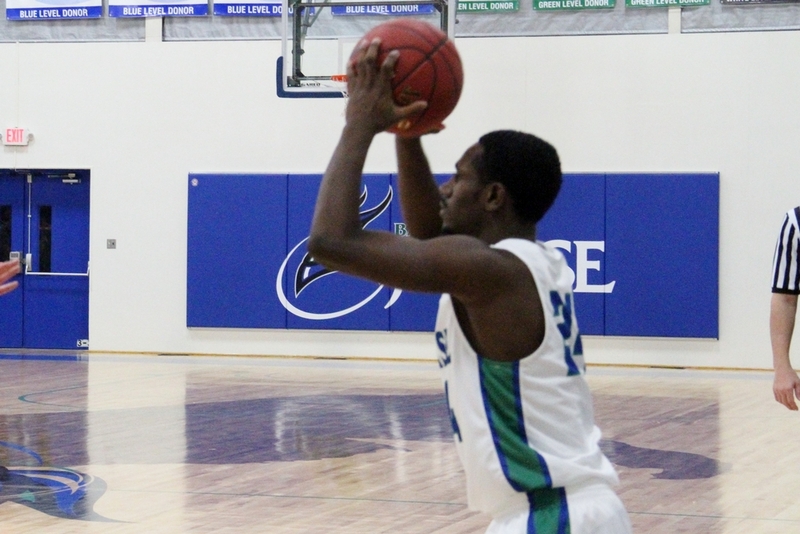 I need to work on defense, that's for sure." 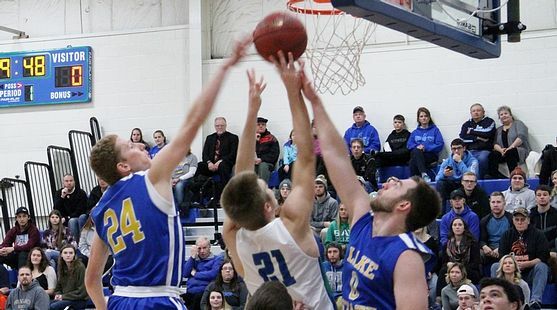 Negaunee's Dre Tuominen had 14 points, including eight of ten at the foul line. Bay shot just 9-of-20 at the foul line during the first half, but was better in the second half, making 15-of-19 free throws. The Junior Lakers made 17-of-27 free throws. 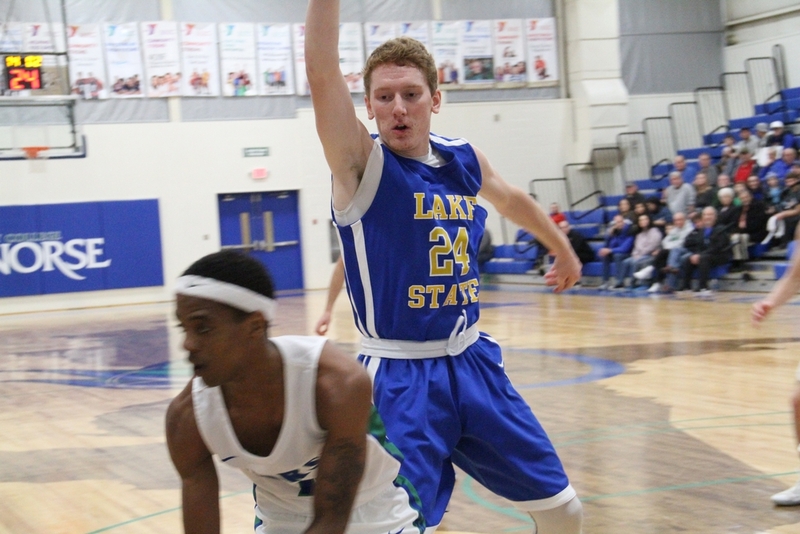 The Junior Lakers, playing their first game of the season, made nine three-point baskets, with Jacob Holzhei and Ryan LaPrade each sinking three of them. 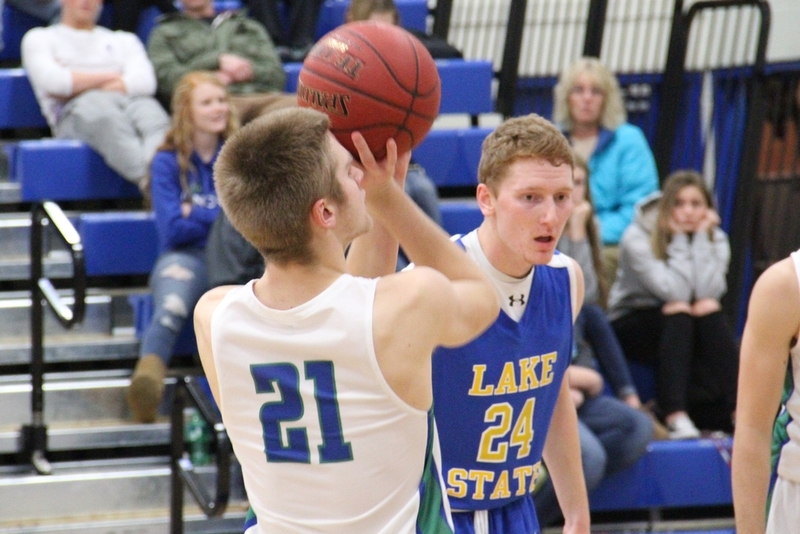 Holzhei had 17 points, and Iron Mountain graduate Tanner Huotari added 14 for LSSU. 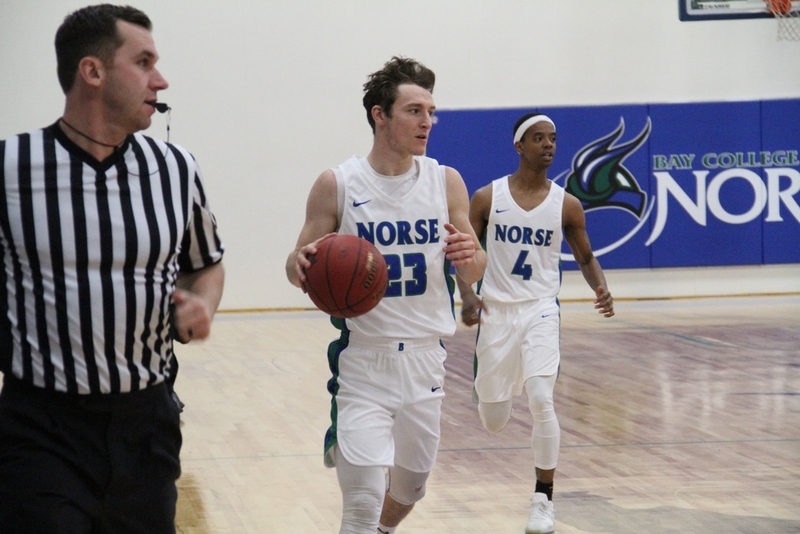 The Norse (4-3) travel to Ironwood this weekend to compete in the Lindquist Classic, hosted by Gogebic Community College. 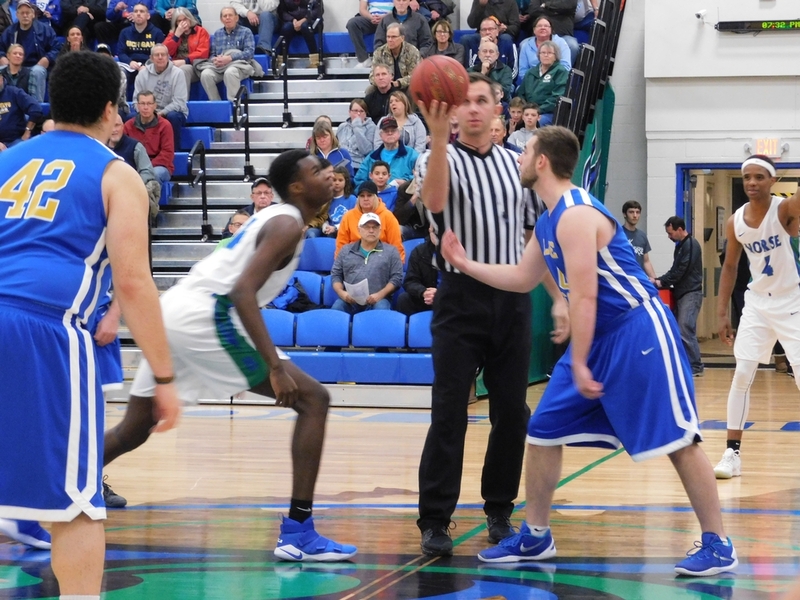 The men play on Saturday against Hibbing (Minn.) Community College, where Johnson coached for twelve years. Saturday's game starts at 4:00 ET and will be broadcast on WMXG-FM (Maverick 106.3), and on-line at www.radioresultsnetwork.com. The Bay women play at 2:00 ET. Click the thumbnails in the ARTICLE HIGHLIGHTS above to see video highlights, listen to interviews with Richmond, Schultz, Briggs, and Johnson...and to see photos taken by Dan Williams.